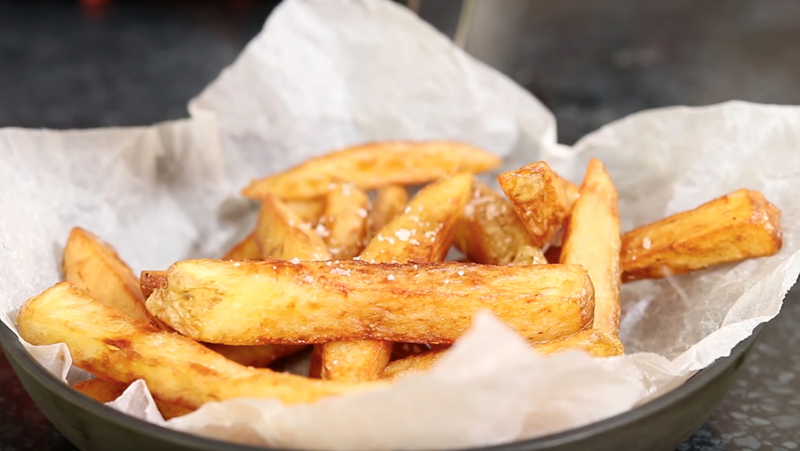 Wash and prepare your potatoes to the size that you want your fries to be and then place them in a large pot with the water, salt, sugar and vinegar. Bring up to the boil and then turn the heat down and simmer for 5 minutes. After 5 minutes remove from the heat and drain in a colander. Either leave in the colander or spread out on a clean cloth on the countertop to cool completely. Whilst the potatoes are cooling, heat your oil to 150C / 300F. Once the potatoes are cooled drop into the hot oil and fry for 5 minutes. Remove from the oil and turn the temperature up to 190C / 375F. When the oil reaches the hot temperature drop the fries back into the oil for 2-3 minutes to turn nice and crispy. 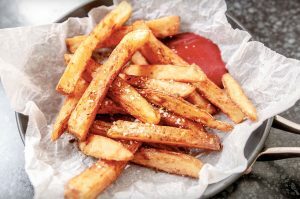 Remove from the oil and allow to drain in a bowl with kitchen paper before serving, sprinkled with salt, pepper or the seasoning of your choice.